During a time when Morehouse College should be celebrating 150 years of serving its community through the education and production of successful black men, interim President William “Bill” Taggart has been tasked with creating a new legacy and getting back to the core values on which the college was founded. 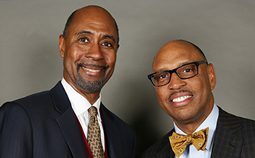 On Thursday, Taggart and Willie Woods, the college’s new board of trustees chairman, began to publicly articulate their thoughts on Morehouse’s future and what it will take to regain trust of the student body. One of the first courses of action, Taggart said, is to unify everyone under the focus and mission of the Atlanta school. The college’s success has been overshadowed by events that began nearly two months after the start of the 2016-17 school year, causing distrust and strained relationships among the faculty, students and administration. In October 2016, an online petition created by Morehouse alumni called for the termination of then-President John S. Wilson’s contract, with petitioners expressing feelings of alienation and citing declining alumni participation because of Wilson. In January, the school’s board of trustees voted not to renew Wilson’s contract before its expiration in June without explanation. In February, representatives from Morehouse’s Student Government Association filed a lawsuit against the college’s board of trustees after student and faculty trustees were barred from the meeting that would ultimately end Wilson’s term as Morehouse’s president. Last month, a quorum of faculty members voted to express no confidence in Robert C. Davidson Jr., then-chairman of the board of trustees. Davidson voluntarily resigned shortly after. The effects of the leadership changes were felt and expressed mostly by students, but faculty members also disclosed their thoughts about the shake-up and the future of the institution. The concerns of the students, faculty and alumni have been heard by both Taggart and Woods, which is why the pair have been working toward getting Morehouse back on its intended path. Woods graduated from Morehouse in 1985 before heading to Harvard University’s business school. He went on to have a successful investment banking career and started his own business as co-founder of a private equity firm. Taggart said he intends to address some of Morehouse’s past issues and instill trust among students, alumni and supporters by opening the lines of communication, reaching out to parents and students to let them know leadership changes have taken place. More importantly, he said he’d assure current and prospective students that Morehouse will be fine. The educational development of students, building moral character, a focus on graduation rates, fundraising tactics, supporting faculty and developing leadership are several priorities that Taggart intends to tackle during his tenure. Taggart has already met with six groups of employees for question-and-answer sessions, and he said he noticed a renewed spirit and revitalization on campus — especially from those looking forward to commencement next month. Rhoden Fellow C. Isaiah Smalls II assisted with this story.